Tarleton Knifemaking Workshop a Success! 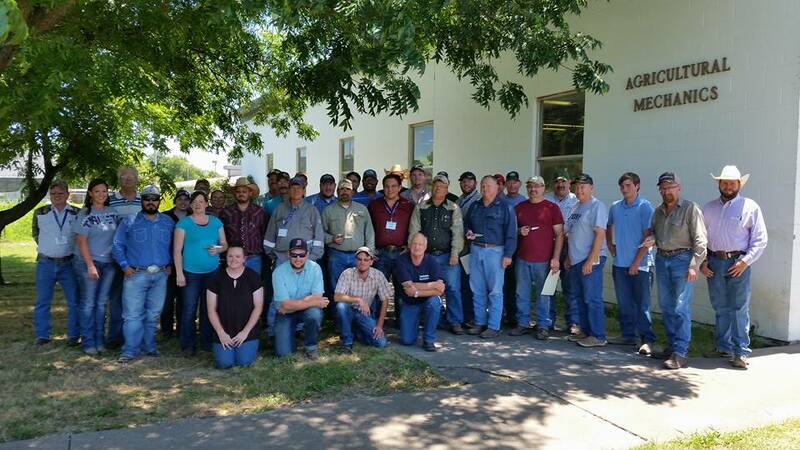 The Tarleton State University Agriculture Mechanics department Texas Knifemaker’s Guild partnered June 21-23 to host a knifemaking workshop. 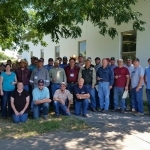 Offered as a continuing education workshop for Texas agriculture and shop teachers, the experience was focused on each student building a complete knife during the workshop. They say “Everything’s bigger in Texas,” and this workshop was no exception. 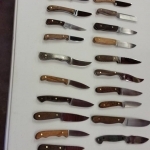 24 Ag teachers, 8 TSU students and employees, and 10 knifemakers made a total of 42 knives over the 2 ½ day workshop. Each participant started with a bar of steel. Knife designs were chosen and then the knives were ground to shape on 11 professional-grade belt grinders provided by TSU and the TKG instructors. Knives were hardened in a pair of forges and a heat treat oven by the end of the first day. On the second day, the knives were polished using a variety of methods including machine finish, hand sanded finish, and buffed mirror finish. On the third day, the knife handles were shaped and finished and the knives were sharpened. 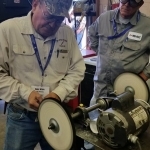 In order to provide a technical education in addition to the hands on skills, instructors gave classroom lectures on steel selection and heat treatment, handle design and finishing, buffing a mirror finish, knifemaking tools, and how to judge a knife for fit and finish. It took a great convergence of effort, resources, and intent to produce a successful workshop of this magnitude. 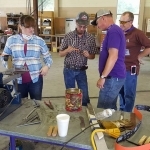 Tarleton hosts a variety of summer continuing education workshops, and provided the knife workshop under the umbrella of their summer education series. 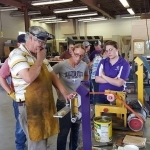 The workshop was hosted at Tarleton’s Ag Mechanics building, which featured both classroom and open workshop areas. The Texas Knifemakers’ Guild is a nonprofit dedicated to the promotion of knifemaking, primarily by bringing people together to discuss and learn knifemaking through local events. “This was a great opportunity for the TKG to meet our fundamental purpose of teaching knifemaking,” said Jason Fry, TKG president. “Not only did we get to teach our craft to people who were exited to learn, by teaching teachers who will then go on and teach their students, our influence was exponentially multiplied.” Dr. Ted Ford, Tarleton professor and workshop host said that the knife workshop was the “hit of the summer workshop session.” “What made this workshop great was the helpful tips, demonstrations of techniques, and on-the-spot corrective work that enabled each student to leave with a knife they could be proud of,” Ford said. By the time everyone got home, reports were already coming in of students buying steel and planning equipment purchases for their school Ag shops. Multiple donors contributed substantially to the workshop, including Jantz Supply, Saint-Gobain abrasives, the parent company of the Norton brand, and River Star Farms. Steel, handle material, and epoxy were donated by TKG members including Valerie Hilliard (handle materials) and James Huse and Andy Dear (Blade Bond epoxy). Many of the TKG instructors brought 2×72 belt grinders, and every instructor brought clamps, jigs, and all the little gizmos it takes to make a bunch of good knives in a hurry. Many connections were made along with the many knives, connections that will carry the craft of knifemaking further in the state of Texas. 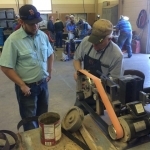 Who knows, but maybe the next Loveless or Warenski will one day trace his (or her) knifemaking education all the way back to this Ag teachers workshop. Everyone left with a knife!